A bunion is an unnatural, bony bump at the base of the big toe where it attaches to the foot. It develops when the pressure of your body’s weight persistently falls unevenly on the joints and tendons in your foot, causing the joint of the big toe to get bigger and stick out. Anyone can develop bunions, but women are more prone to this bone deformity than men. Experts believe that wearing tight, high-heeled or too-narrow shoes contribute to the development of these bony bumps. Other possible factors are your inherited foot type, foot injuries and certain foot deformities present at birth. Certain types of arthritis can also increase the risk of developing bunions. Because a bunion occurs at a joint, it can cause extreme pain while walking as well as reduced flexibility of your big toe. Other symptoms include irritated skin around the bunion, joint redness and pain, corns or calluses, blisters at the affected site and possibly a shift of the big toe toward the other toes. It can even make it more difficult to find shoes that fit properly. 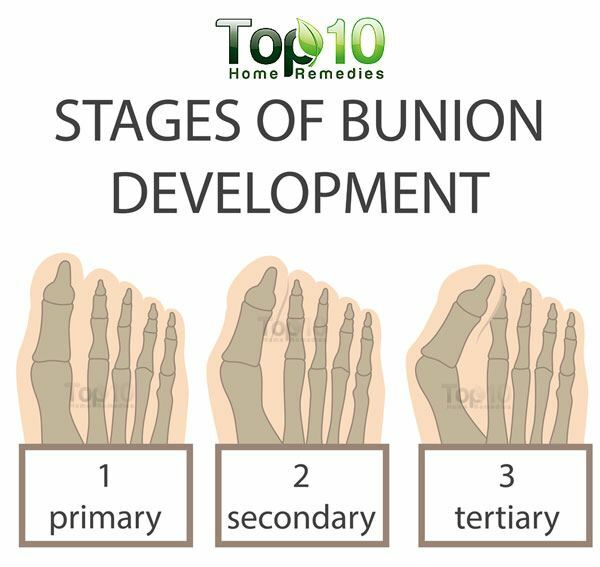 Bunions are progressive and usually get worse over time. Some natural treatments can help address symptoms, but they cannot correct the actual deformity. In cases of severe discomfort, surgery may be needed to correct the problem. Here are some home remedies to help ease the symptoms of bunions. Bunions often become sore and inflamed after you have been on your feet for too long. To relieve pain and inflammation, ice therapy is a good option. The cold temperature temporarily numbs the nerve endings and provides pain relief. Put a handful of crushed ice in a thin towel and wrap it. Place it on the affected area for 5 to 10 minutes. Take a break for 10 minutes and repeat the procedure 2 or 3 more times. 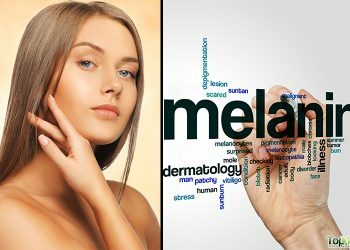 Massaging the affected area daily is a popular way to alleviate as well as prevent this problem. This therapeutic method helps increase blood circulation to the area and provides relief from the general discomforts. Regular massage will even reduce the size of the bunion and make the affected area less susceptible to corns and calluses. Rub some warm castor, olive, or coconut oil on the affected area. Using your fingers, do deep-friction massage for 10 minutes. You can always seek assistance from an experienced massage therapist to help slow down or reverse the formation of the bunion. In many cases, exercising your foot can help reduce the pain and promote toe flexibility. It can also slow down the progression of your bunion, thus preventing the need for surgery. Daily exercise also helps strengthen the muscles of the legs and feet and may prevent bunions from developing. Sit on a chair and place your foot on a tennis or golf ball. Roll the ball beneath the mounds of the toes, then anywhere else on the sole that feels tight. Do it for 5 to 10 minutes daily. Sitting on a chair, cup the sole of the affected foot in your palm, then interlace the fingers of your free hand between the toes of your foot. Bend the toes back and forth, upward and then downward, for 5 to 10 minutes. Stand up straight and point your toes straight ahead for 10 seconds, then curl them under for 10 seconds. Repeat several times. These are just some exercises that you can easily do at home. There are many more helpful exercises that you can learn from an expert. For bunions due to arthritis, you can try an Epsom salt soak to alleviate the pain. The high magnesium content in Epsom salt helps regulate the pH levels in the body, which is essential to fight inflammation and pain. A warm Epsom salt soak will also take care of corns and calluses, common symptoms associated with bunions. Pour some warm water into a small tub. Add a handful of Epsom salt to the water and stir thoroughly. Soak your foot in it until the water is cold. Dry your foot thoroughly, then massage with warm olive or coconut oil. You can also use turmeric to treat bunions. Its key component, curcumin, has pain-blocking ability and also helps reduce inflammation. Turmeric can be used topically as well as orally. 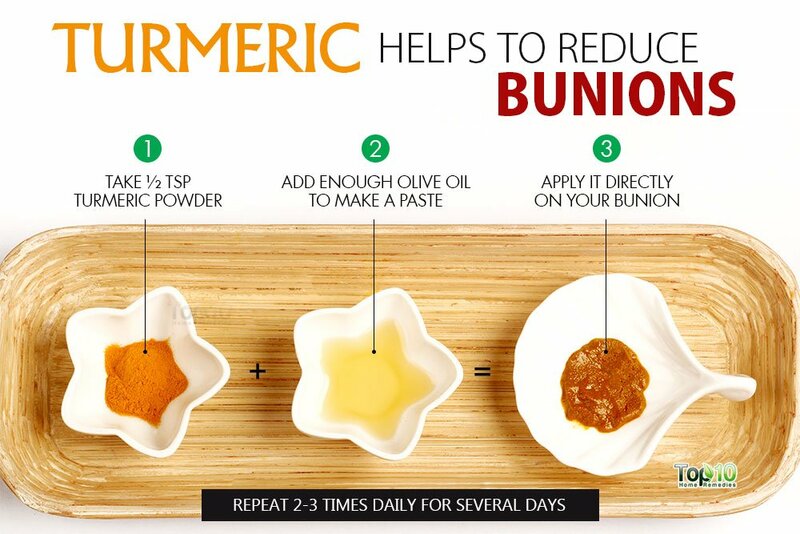 For topical use, make a paste of ½ teaspoon of turmeric powder and a little olive oil. Apply it directly on your bunion. Repeat 2 or 3 times daily for several days. 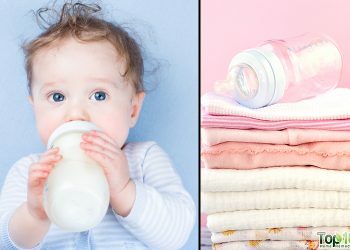 For oral use, stir 1 teaspoon of turmeric in a glass of lukewarm water or milk and drink it twice daily. You can also take 400 mg curcumin capsules, 3 times a day. However, consult your doctor before starting a supplement. 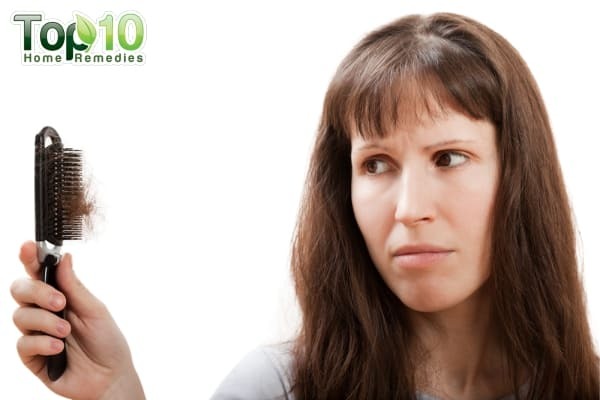 Chamomile is a popular and effective herbal remedy that can provide relief from bunion issues. It has anti-inflammatory properties that help reduce pain and inflammation. 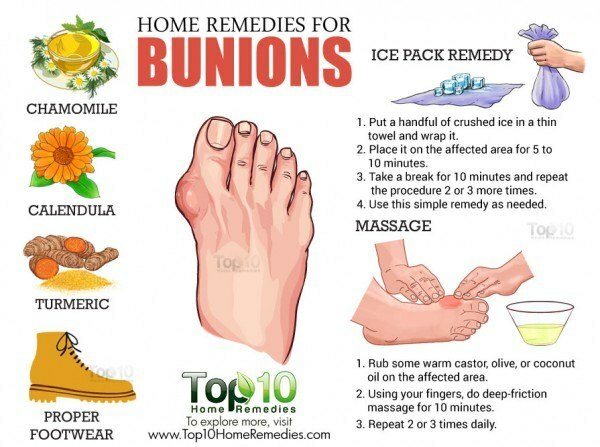 It may even help shrink bunions. Brew a cup of tea using a chamomile tea bag and sip it while it is still warm. Also, put the used tea bag directly on your bunion. Use this home treatment 3 or 4 times a day. Massage the affected area with chamomile essential oil mixed in a carrier oil every night before going to bed. This will help improve the alignment of the toe. You can even apply some over-the-counter ointment that contains chamomile on the affected area to reduce pain and inflammation. 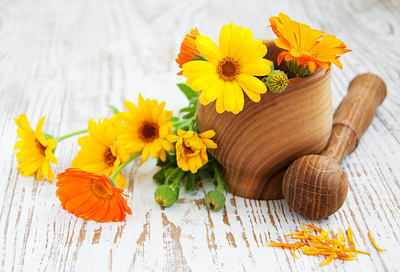 Another effective herbal treatment for bunions is calendula, also known as marigold. This herb has anti-inflammatory properties that help reduce pain and inflammation. It even prevents the formation of corns and calluses on the affected area. Gently crush some calendula leaves with your hands to extract the juice. Apply the juice on the affected area and allow it to dry on its own. Repeat 2 or 3 times daily. Alternatively, you can buy calendula ointment from an herbal store and apply it on the affected area 2 or 3 times daily for several days. 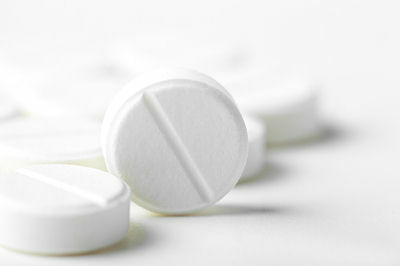 Aspirin that you use to treat headaches can also alleviate the discomforts associated with a bunion. It can reduce stinging pain from the inflamed area. Plus, it keeps the affected area soft to prevent corns and calluses. Dissolve 2 to 3 aspirins in a small tub filled with lukewarm water. Soak the affected foot in this solution until the water becomes cold. Pat your foot dry and massage with warm olive oil. Repeat once or twice daily to reduce pain. Note: Always do a patch test before trying this remedy as aspirin may cause skin irritation or allergies in some people. To minimize your chances of developing a bunion as well as reduce the need for surgery if you already have one, pay attention to your footwear. Always opt for footwear with wide front, broad toes and soft soles. Use padded shoe inserts to help distribute pressure evenly when you move your feet. If you have a bunion, opt for shoes with a wide and deep toe area. Sandals are a good choice. Do not wear shoes with heels higher than 2¼ inches. Do not wear high-heeled shoes for longer than three hours at a time. Choose footwear that conforms to the shape of your feet. Never force your foot into a shoe that doesn’t fit. Along with shoes, avoid tight-fitting socks or stockings. Remove your shoes periodically during the day to give your feet a break. To curb pain and inflammation associated with bunions, it is essential to keep an eye on what you are eating. 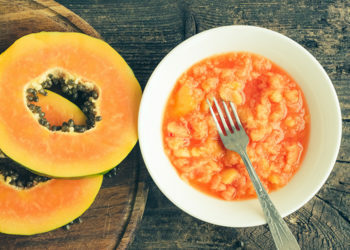 Many foods have anti-inflammatory properties that can help prevent and combat inflammation, while others contribute to inflammation in the body. 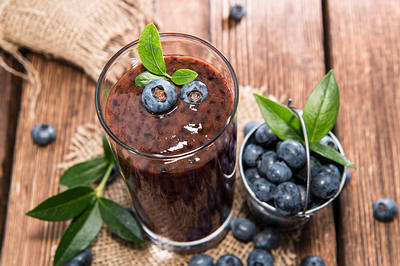 Some good anti-inflammatory foods include olives, salmon, ginger, turmeric, garlic, tart cherries, strawberries, blueberries, walnuts and sweet potatoes. Try to eat some of these foods daily. At the same time, avoid foods that promote inflammation. 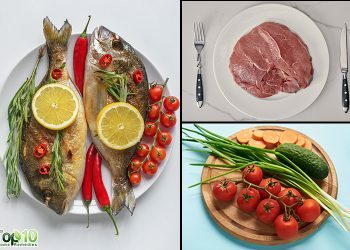 Such foods include red meat, processed meat, refined sugar, eggs, whey protein, corn oil, refined salt and refined grains. In addition to eating anti-inflammatory foods, try to increase your protein intake as well as foods rich in vitamins A, B complex, C and E.
If a bunion is present and becomes inflamed, keep the affected foot elevated for 15 minutes every other hour. Acupuncture can be useful in treating the symptoms of bunions. After washing your feet, make sure to dry the area between the toes well. If you have corns, use over-the-counter corn plasters to get rid of them quickly. Always ensure that children’s footwear is properly fitted. Try over-the-counter arch supports to get relief from the symptoms. If your doctor has prescribed some specific orthotic devices, use them accordingly. Thanks for providing the information, I like it. Thank you so much for the information. I like it. thanks will try this home made method. Thank you very much. These treatment are simple and not expensive . I will follow these treatment. Thank you so much for your info. It was very helpful !! All great ideas and dealing with an inflamed bunion now (first time) so I’m going to try the turmeric as well as foot soak. Great detailed information. Thanks for your info, much appreciate!! Will try the home remedies.